I had the unique opportunity to be introduced to Dawn M. Lombard of Lavender Dawn Handmade Lampwork Beads. I've always been fascinated by the artistic craft of blown glass and lampwork bead making. In fact, I took a class myself and let me tell you, it's not easy. I'm sure, as with anything, over time you get used to the technique and the need to keep turning the bead while it's in the flame. But for now, I think I'll continue to admire the works of art of other designers. Read below for a fantastic interview with Dawn and at the end of the interview, you'll find a contest to win a beautiful set of handmade lampwork beads, made exclusively by Dawn, for you! How did you get started in lampworking? I love telling this story. My sister Sara begged me to go with her and my mom to an introductory lampwork class. First off, I had never even heard of lampworking and second, I have no patience whatsoever – so the thought of me sitting at a torch and melting glass had absolutely NO appeal to me. But I reluctantly agree. Within the first hour, my life changed. Prior to this class, did you have an artistic or craft history? Ironically, I wanted to be a graphic designer when I started college and majored in studio art. At that time, hand-rendered graphics were still being done. My dad gave me the best tip in the world and explained that computers would take over the entire process. I trusted his judgment and changed my major to business administration (Marketing). My artistic side went dormant for many, many years. What has surprised you most about working with glass? I never expected the process to be so meditative. I find molten glass extremely soothing and, after a long week of crunching the corporate numbers, I easily get lost in the fluidity of the glass. I also am fascinated by the chemical reactions that occur when you blend certain colors and use metal with the glass. At my studio, I use a Carlisle Mini CC with tanked O2 and propane. My boyfriend build me a kiln out of a large metal mailbox (it works fabulously and we love it – heats up very quick and was easy to make). At my boyfriend’s studio, we use a Hellcat and a Bluebird annealer. I don’t care for the Bluebird so much since it really takes a long time to get those firebricks up to temperature. I actually travel to his house with my homemade mailbox kiln. I use both Moretti and Borosiliciate. I am very comfortable with soft glass and am still struggling with the boroscilicate -they both work very differently. Do you have any favorite colors or combinations of glass rod to work with? I absolutely love dark ivory soft glass with silver leaf overlay. The chemical reaction produces the most amazing blues and greens – very unique and organic looking. I am a die-hard fan of Fusion bead release. There is something very different about their mixture – it has more of a sand-like quality and I have never had it break on my while working a bead and all of my beads slide effortlessly off the mandrel. The quickest way to make a dazzling bead that looks like it took a long time to make – simply buy a jar of Raku frit. The color it produces is amazing and applied over light opaque colors is just stunning. Just don’t cook it too long or it will burn. Are you a “sets” person or a “focal bead” person? Totally a focal person – I like to let the glass take over when I am at the torch. To make matching spacer beads is a mundane, repetitive chore to me – I do it but I sure don’t like it. It is a necessary evil if you want to make a stunning piece of jewelry though. Have you developed a “signature” bead, a unique type of bead that is recognizably yours? Yes, it is the ‘Volcano’ bead – a cone-shaped bead with wisps of color. I just love making them. I am still struggling with shaping borosilicate – you really need to ensure your footprint of glass evenly placed before you encase it in clear or it looks wobbly – I have a lot of those in my reject jar. What remains a challenge for you in hot glass bead making? Hard center-lined bicones are truly a challenge for me – it is the edge that I cannot get crisp – there must be a secret to getting that fine line. Do you still have the first beads you made? What do you think of them now? Of course I do – I still wear the very first one I made in that intro class 4 years ago. It is the ugliest bead I have ever seen but I wired it up and slipped it on a chain and wear it very proudly. I really helps to put things into perspective when I am especially hard of myself when I don’t have a ‘perfect’ beading session. How have your beads changed? Since you started or over the years? Absolutely, I have moved away from bright color contrasts and moved to more subdued colors – I feel that provides me with a better expression of my vision of the beads – I love an organic, earthy feel and color creates that feeling. What was your scariest beadmaking experience? When I didn’t understand the ‘tempering’ step of glass – warm the glass slowly or it shatters. Well, on a cold December night a rod of glass shattered and a piece stuck to my face. Very terrifying and so thankful it didn’t leave a scar. Do you have a humorous beadmaking experience or moment to share with us? 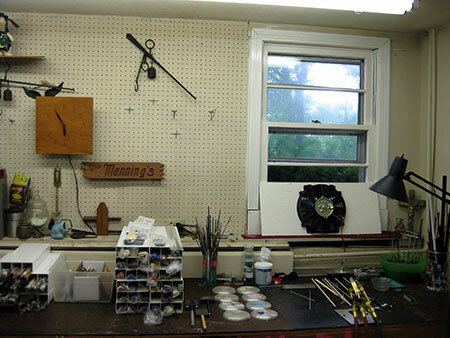 During a live demonstration at one of my art shows, I could not stop the rod from shattering. It was a windy and cold October outdoor show and I was chasing the flame. Every time I caught the flame, the glass would shatter. It was so embarrassing and the folks who were watching didn’t believe I actually MADE the beads (because I couldn’t show them). Quite funny in hindsight. Have you had any “glass epiphanies” while working? Patience – I recently came to understand that working further away from the flame will let you work metals longer without burning. I was always going for that quick result (working too hot) and getting mud in the end. Stringer control is also all about heat control – it has gotten so much easier now that I work cooler. Do you have a technique, method or tip to share? Really clean those beads – even the smallest amount of bead release left on a bead can be seen and can leave ‘chalk’ marks on some necklace materials. Another tip: an oil paint spatula is great for creating a flat end on beads! Do you have any advice or encouraging words for someone who is just starting out in glass? Patience!!!!!!!!! Don’t give up on the glass – PRACTICE PRACTICE PRACTICE – one day it will all just come together. No great artist was a great artist from day one. It takes time and if you want it from deep down in your soul, it will come together. WIN THESE BEAUTIFUL LAMPWORK BEADS! 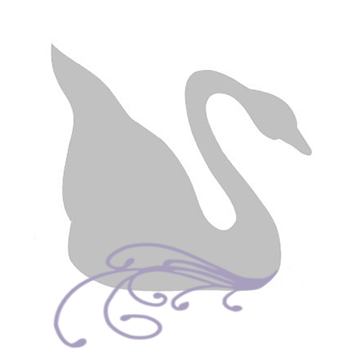 How to enter: Just leave a comment below noting one of your favorite beads from the Lavender Dawn shop. 1 winner will be chosen randomly June 21st and notified by email. Good luck! 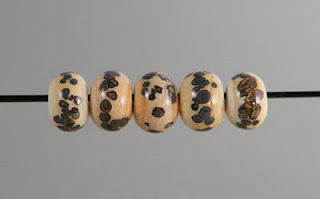 About the contest beads: The two end beads are 11mm wide, the three middle are 12mm wide, all five are approximately 1mm tall. The beads were made with Italian Moretti glass (otherwise known as 'soft glass' or 'soda lime' glass). Dawn used a light ivory on the 2 smaller beads and ivory on the three others. Once the beads were shaped, she decorated them with a frit (broken pieces of glass) called Raku. Raku produces pretty shades of blue, brown and specs of red. Thank you to Dawn for a fantastic interview, glimpse into lampwork glass bead making and for offering such lovely lampwork beads for the blog contest. Hey Stephanie! What a great artist you found in Dawn. I love all the glass beads in her store. :) This was the first I had learned of Dawn's talent, so I look forward to seeing more in the future! :) Thanks for the friendly intro! Dawn is an amazing lamp work artist. I am always in awe of people like her who can work with glass and flame! Dawn's work is amazing! I love the Sienna bead--I just love the swirls in the brown, it's just so pretty. Beautiful work! I like Volcano II, both the bead and the name. Your creativity is wonderful! Dawn is a great glass artist...I'm always so impressed with those who make these wonderful beads!!! I think my favorite bead would be Volcano II...but can't forget Odyssey with the gorgeous turquoise!!! I love the Volcano I - Handmade Lampwork Focal Bead! Thank you to everyone who participated. CONGRATS to Robin - the winner of five handmade beads (perhaps she will share with us her creation). I apperciate all of your comments - means a lot to me. Check back often for new additions to my Etsy site (www.LavenderDawn.etsy.com) and also on my blog (www.LavenderDawnJewelry.blogspot.com).